"SIP, SIP, SIP" that's all we hear lately. Why? Simply put, the Session Initiated Protocol (SIP) is the means to an end, bringing about the convergence of communications. SIP is the conduit that will bring together the enterprise and telecommunications to provide IP-based communications. Enterprises have worked for many years to provide triple-play - voice, video, and data - services. The enterprise has grown from data services and is working towards adding voice and video services over the network. Meanwhile, the telecommunications industry has grown from providing voice, then video, and now data services. As telecommunications migrates toward being able to provide comprehensive IP services, a standard method of providing sessions is needed. Many protocols came before SIP, such as H.323. While H.323 provided an all-in-one solution, it was not flexible enough to provide for much beyond voice services. SIP also brings Web 2.0 concepts into fruition, but in a completely different manner. SIP is a primitive in that it does not provide services; it provides a conduit for services. For example, consider SIP a regular telephone line. The telephone line doesn't provide a service; it provides the ability to connect services. For example, we can talk - choose a language, use a modem for data, or even pump the modem full of multimedia services. As long as the end-points (users) agree on what is being sent and how to view, listen, and so on, SIP can provide the session. SIP is a component of a complete multimedia architecture, and relies on other Internet Engineering Task Force (IETF) protocols. The SIP typically will use the Real-Time Session Protocol (RTSP) to provide transportation and quality of service (QoS) feedback for streaming media. Other standardized protocols control access to the public-switched telephone network, as well as describing multimedia sessions. While SIP uses these protocols, it is not tied to them if a better solution arises. This is one of the great things about SIP over its predecessor protocols (H.323); it does not have to be redefined to move onto something better. 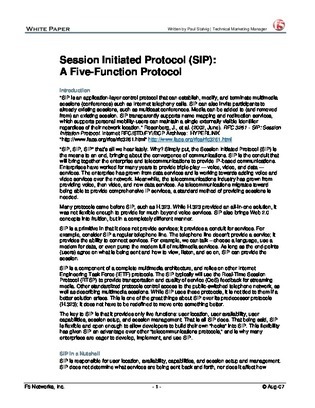 The key to SIP is that it provides only five functions: user location, user availability, user capabilities, session setup, and session management. That is all SIP does. That being said, SIP is flexible and open enough to allow developers to build their own "hooks" into SIP. This flexibility has given SIP an advantage over other "telecommunications protocols," and is why many enterprises are eager to develop, implement, and use SIP.